Our final day in France had come, and we were determined to spend it as fruitfully as possible. Fruitful it was too; we spent the morning touring the beautiful town of Avignon and the magnificent Palais des Papes, with its imposing ramparts and flying buttresses. Lunch was to be had at a little cafe close to the Palace, when one of our number (who'd been craving French-style pork knuckles for two weeks) delightedly espied said dish on the chalkboard display menu. Since I'm not fond of pork, I decided to opt for the souris d'agneau, literally the mouse of lamb (although with my poor French I originally thought it meant the smile of lamb), or more accurately, lamb shank. 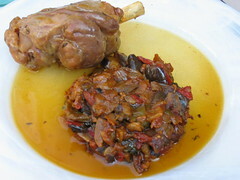 This top portion of the gigot, or leg, is considered the best part of the lamb's leg, and is apparently the bit everybody in France scrambles for. It should be said that this was part of my motivation for trying out the osso bucco a few weeks back. 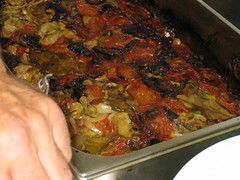 The shank was served with Provencale vegetables that included tomato, zucchini and onion. I really enjoyed this dish, which was simply but well done. The lamb was tender to a hilt, and the melange of flavours from the vegetables provided an effective and welcome contrast. While the lamb was slightly gamey (it wasn't all that young), I never really find strong flavours a problem, so it was all good for me. I was seriously considering skipping dessert and leaving more room for dinner, but what the heck, it was our last day. I know, I know, chocolate coulants have been done to the death everywhere, but sometimes you just need that chocolate fix. Also, the way it was done just made me souris (that's smile, not mouse). 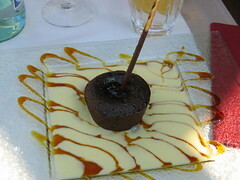 Unmoulded into a platter of creme anglaise and caramel sauce, the coulant was very satisfying. Molten chocolate and creme anglaise go very well together; and is as classic a combination as the vanilla ice cream molten chocolate cakes are usually paired with. The only thing I found a bit odd was the Pocky stick speared into my coulant like some confectioner's lightning conductor, but then again, who am I to comment on slightly pretentious ornamentation? Our last dinner in France was at the two Michelin-starred L'Oustau de Baumaniere, the restaurant of the hotel we were staying at. 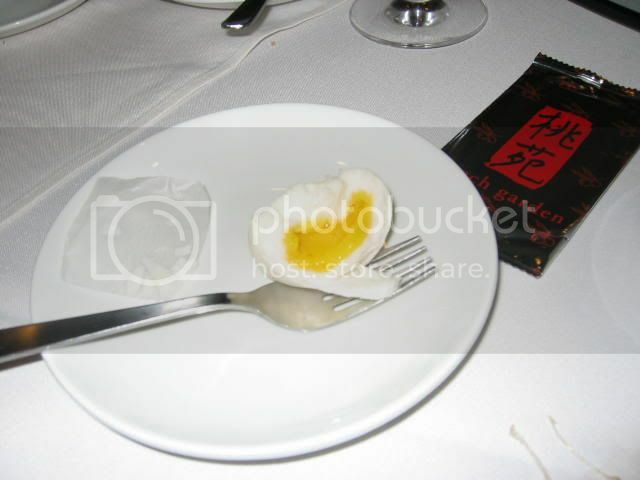 Dinner commenced with an amuse-bouche of pumpkin cream soup, with what I believe is some tomato oil and shaved truffle. Having always served pumpkin soup straight, I was quite intrigued to discover that the shaved truffle and tomato oil added a depth of flavour that worked quite well to enhance the creamy sweetness of the pumpkin. Feeling brave, I ordered the tomato tartare for starters. I was doing reasonably well too, as fresh tomatoes can really get you going. Is tart sweetness an oxymoron? If so, then fresh tomatoes are oxymoronic. So things were going swimmingly until I poked some red paste hiding underneath one of the tomatoes. I bit into it, and the clashing sourness shocked my tastebuds into hibernation. I am guessing what I had were pureed sun-dried tomatoes, but whatever they were, they were bad. 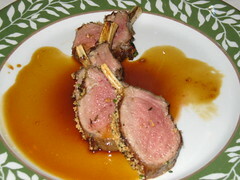 Main course was a roast rack of lamb that was carved up right at the table. You can see the beautiful herb crust and that luscious, tantalising pink hue of the lamb cutlet - just begging to be eaten. While the lamb was quite superb, I was a little disappointed by the otherwise barren dish. As good as the lamb was, it deserved to be accompanied with some side-dishes to provide a full-bodied meal, not by itself on an empty plate with some sauce. Very disappointing for a two-star restaurant. 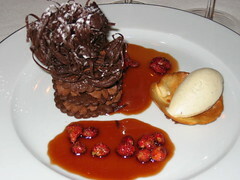 Dessert was a layered chocolate affair with wild strawberries and chocolate tuille as well as vanilla bean ice cream. I found it slightly difficult to eat as the layers of chocolate cream were almost impossible to partake of in a civilised manner. While it was undoubtedly a very beautiful creation, I did feel somewhat that the patisseur who created it had prized form over substance, resulting in a elegant dessert that lacked a little oomph in the taste department. And with that, the gastronomical account of our journey around the South of France comes to an end, and completes what I hope is the first of many pilgrimmages of food around the world. It is often the case that on extended vacations to Occidental countries, a craving for Oriental food kicks in after a few days. This craving is directly proportional to the average age of the vacation group as well as the distance of the vacationing country from the home country. That being said, I was surprised and impressed that we had managed to go so many days without having any Asian food at all. By the tenth day though, the urge was just to strong to resist. We all trooped down to a Vietnamese joint in St. Remy for a quick lunch. If you recall, St. Remy was the scene of a disappointing lunch a few days earlier, and this time around it was no different. One of the waiters in the restaurant looked like a Vietcong, and would probably have as happily killed us as brought us our pho. The French though, apparently are quite fond of Vietnamese food, because there were a number of French couples and families having lunch, braving the murderous waiter and the lethal amount of MSG in the pho. How can anyone go to a Vietnamese place and not order spring rolls? 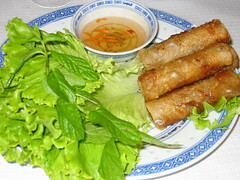 The rolls came accompanied by some fresh lettuce, and were heavily deep fried. They were passable, but certainly not authentically Vietnamese. 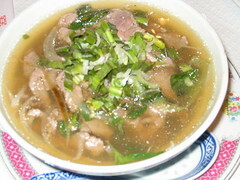 Almost everyone opted for the beef pho, since that's about as Vietnamese as it gets too. Unfortunately it contained more monosodium glutamate than beef, and left my mouth and throat tingling with irritation. I think it's safe to say that everyone thought that lunch was pretty much of a let-down, so the less said about it, the better. Dinner was at La Riboto de Taven, a charming restaurant near our hotel set in the lee of a rock face. We were shown to a dining room which we shared with some other diners (though ours was by far the largest table), and dinner commenced without much deliberation, since the menu was set, saving us the need to make any agonising choices over what to eat. 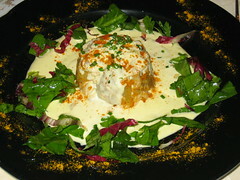 Dinner commenced with a starter of artichoke and salad in a creamy sauce akin to hollandaise. Artichokes are not commonly consumed in our part of the world, and appear exceedingly formidable when you first view them, but are in truth, extremely delicious. 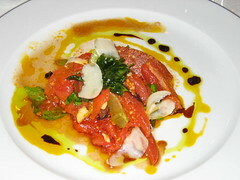 They have body and depth of flavour, yet are not harsh and do not take any getting used to. 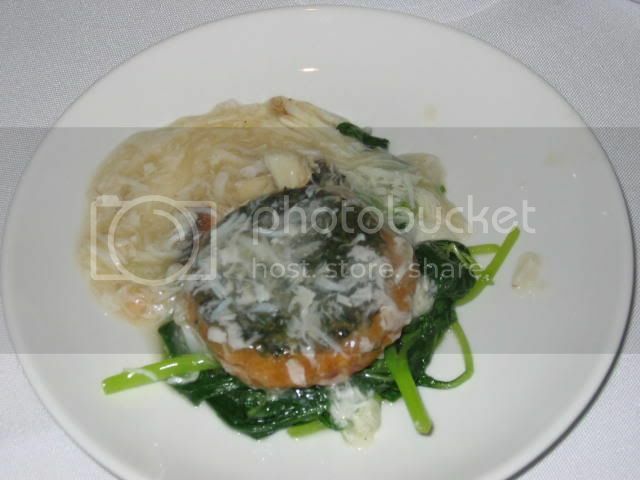 Even my father enjoyed the dish, though he's probably only eaten artichokes on at most one or two other occasions. 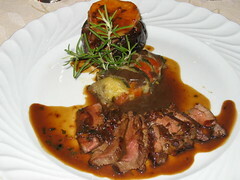 Main course was a faux filet of bull, served with Provencal-style vegetables in a reduced red wine sauce. Now supposedly bull is a lot meatier and stronger in taste than beef, but quite honestly I couldn't have told the difference. It was very good though, and very very tasty. It was quite tender as well, and as the faux filet is, I believe, from the same cut that forms the sirloin, this was rather surprising. 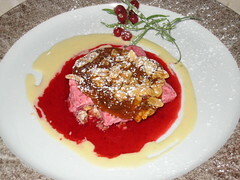 Dessert was a strawberry and nut affair. I don't like strawberries and I don't like nuts, but on top of that I found the strawberry ice cream (sitting underneath the medallion of caramelised praline) intensely sour, and not a very satisfactory end to the otherwise fabulous dinner. As our trip drew to a close, we moved further south-west, deeper into Provence. For lunch, we dined at a little deli place in Uzes, the premier duchy of France. It actually started as a shop selling olive oils and tapenades, but as business improved they started selling easy to prepare food that went well with their products. Rather like our own Cellar Door along Bukit Timah, but slightly more sophisticated. 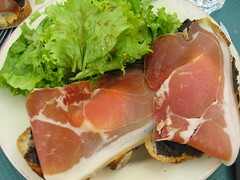 I had a tartine with olive tapenade, ham, goat's cheese and salad. I found the tapenade and the cheese too strongly salty a combination, and the ham wasn't as fine as some of the others we'd had on the trip. After lunch, we walked around for a bit, taking in the sights and sounds, and we came across something so completely old-fashioned and charming, that it could only be a tourist trap, but one in which we willingly ensnared ourselves. 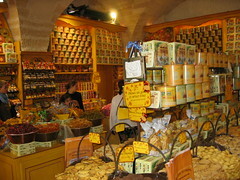 A traditional biscuitier, shop stacked high with biscuit tins and cookies of all assortments, where you could pick and choose your own sweet treats (with a pair of gloves, of course - we're all about hygiene these days). Dinner was at the Bistrot du Paradou, and it occurs to me that I forgot to bring my camera along to dinner that night, and I have yet to scan in the photos that were taken on someone else's camera, so you'll just have to use your imagination for the time being. The Bistrot du Paradou is a small, family-run establishment, almost like a tavern of yore, with plenty of hearty, rustic fare and where customers feel free to make as much noise as they wish to. This was another place with no menu, you just eat whatever the proprietors choose to serve you for the night. 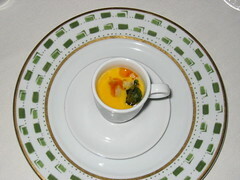 The first course was a soupe au pistou, rather like an Italian minestrone soup, but without tomatoes. Plenty of beans and legumes gave the soup some bite, and with some crusty bread could have been a filling meal in itself. While the soup was very tasty, I did think it was rather salty. Everybody of course had the roasted herbed lamb cutlets, which my father took pleasure in pointing out were much less pink than mine usually are. To be fair, the cutlets were extremely tender, having come from little spring lambs probably not more than a few days old. Everybody inhaled the little lamb chops in a matter of minutes, and had nothing but praise for them. I was surprised by the number of non-traditional desserts they offered, and although I should have known better, I decided to try the panna cotta. I was not, therefore, completely surprised to find that I didn't like it at all. Instead of the traditional vanilla, the restaurant used almond to flavour the panna cotta, which made it taste like the almond milk my mother is so fond of drinking in the mornings, which I cannot stand. Almonds simply disagree with me. Short post for the time being, more substantive material for the last two days of our trip. We interrupt our regular bulletin yet again to bring you this important news update. When people mention chinese food in Singapore, thoughts inevitably gravitate towards the ubiquitous Crystal Jade chain. Now, I'm not saying their food isn't good, because it is, I'm merely suggesting that there exist some viable alternatives. Peach Garden is a restaurant (outlets at Thomson Plaza and Novena) set up former Crystal Jade staff. [Edit: Daniel informs me they actually came from Hua Ting in Orchard Hotel] The seccesionists have done pretty well for themselves, because the restaurants are almost always full. Reservations are therefore recommended. If you do go to the Thomson Plaza locale, please factor in the half an hour it is likely to take for you to park your car. The queue stretches all the way onto the main road, and is most noticeable during the weekend lunch hour. As a result, now we usually only go to the Novena outlet for dinner. Like most chinese restaurants, Peach Garden has a well-furnished interior, brightly lit and without too much kitsch memorabilia littering the place. It can get a little cramp when it becomes packed, and those seated with their backs to the walls will find it a little hard to get out of their seats. 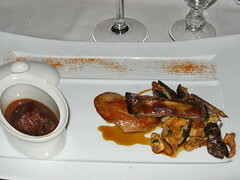 Our first course was the restaurant's signature roast goose dish. It's very well done, as the generous layer of fat on the goose renders (pun intended) the flesh exceptionally soft. Sure, it's oily, but that's all part of the experience. 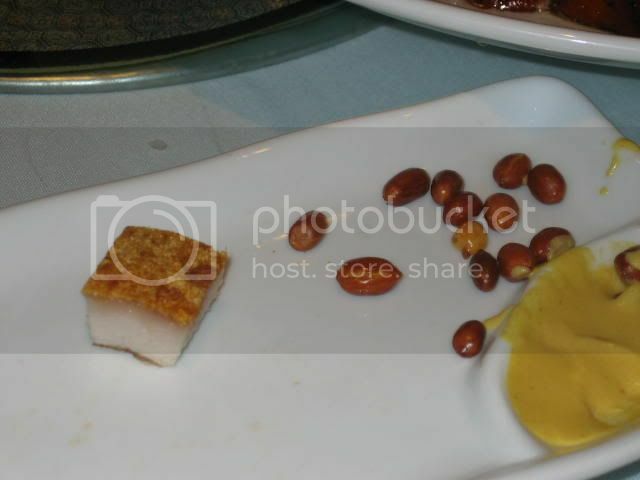 The goose is served with roasted groundnuts, which are a little too hard for my liking. 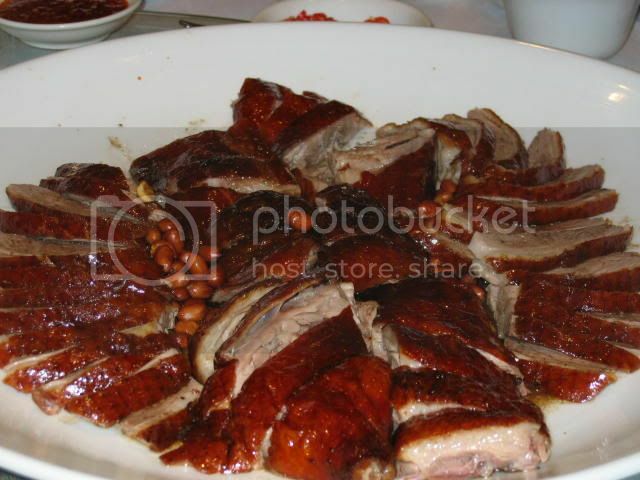 Next was another signature dish - roast pork or siew youk. I love roast pork. The crackle of the roasted skin as you bite down on it is strangely empowering. 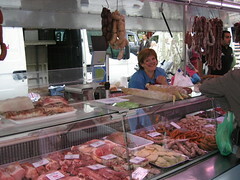 The spurt of juice from the soft meat is sweet and the meat itself is succulent. What I didn't like though, was the accompanying sauce. It had wasabi in it, and just didn't go well with the pork. I'm not entirely sure what this dish was, but I think it was braised crabmeat with some sort of egg cake, with vegetables. Whatever it was, it was quite good, helping to balance out the richness of the previous two courses. Balance is very important in chinese cuisine. 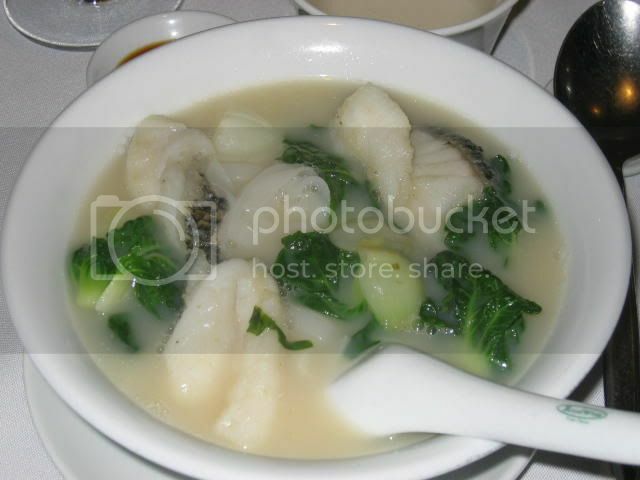 I've had the steamed soon hock at Peach Garden on two occasions now, and on the first, it was absolutely fantastic. Steamed to complete perfection, the sauce it came with was sweet but not artificially so, just naturally flavoured with the taste of the fish. This time around though, it wasn't quite as good. The fish was dryer than I remembered; it didn't slip so easily and silkily down the throat. Still above average though, just not perfect. Now, a soon hock is a pretty big fish (either that or we had two), so we had another dish, this time a fish noodle dish. 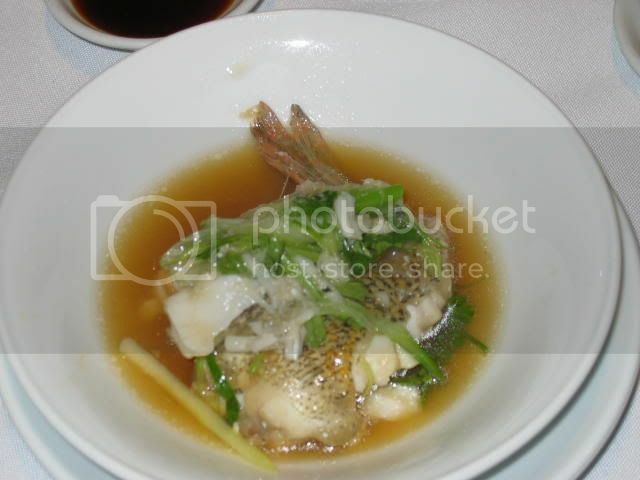 Kway teow was served in a clear fish broth with slices of the steamed fish. Very satisfying, as the dish was palate cleansing and so soothing. Everyone was saying what a good idea it'd be to have lunch at Peach Garden and only have the kway teow, it was that good. My sister had very good things to say about this custard bun the restaurant offers for dessert. It's made from the same flour dough that is used to make char siew paus, but is instead filled a very liquid custard. So liquid, in fact, that it almost seems like egg yolk. I'm kind of neutral to it, though I suspect if I were to try a few more, I'd start developing a real taste for them. Okay these have to be the cutest Chinese desserts I have ever seen. 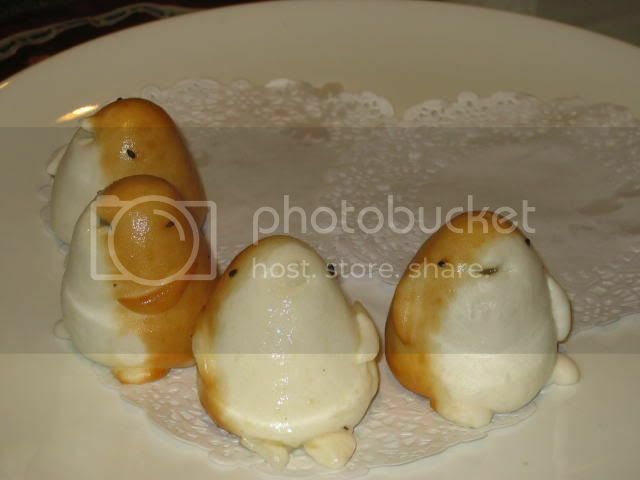 Basically we were given a "special" dessert - a bunch of baked...I don't know what they are...penguins? chipmunks? stuffed with lotus paste. It gave me great pleasure to bite into one of these adorable little animal kins and have lotus paste ooze out of the cavity where the head used to be. Overall, I'd say Peach Garden is an excellent alternative to the upmarket chinese restaurants like Crystal Jade and the other ones I can't remember off-hand but are usually located in expensive hotels. The food is good, service is pretty prompt and friendly, and prices, I imagine, are lower than those found in the above-mentioned restaurants. We interrupt our regular programme to bring you this special bulletin. Now I really like garlic. Garlic and onions are perhaps two of the best plants ever to have been discovered by humanity. I should have been born Italian or something, with my love for garlic. Besides, garlic's good for your health. All kinds of medicinal benefits like lowering cholestrol, acting as an antibiotic, an antioxidant and improves circulation. So anyway, I had a chance to sample some garlic soup at a restaurant some time ago, and it was really good. A little creamy, mild, yet with an undeniable aroma of garlic that washes over you and makes you feel all warm and tingly. I've wanted to replicate that soup ever since, but never found a good recipe. I tried an Aigo Buido recipe out of Julia Child, but that was an unspeakable disaster and should never be mentioned again. While in France though, my dad fished out an article of a paper he was reading and gave it to me. It was about garlic farming, and included was a recipe on garlic soup! I knew I had to try it, especially since it's really simple. I was only cooking for one, so I reduced everything by a third. Six bulbs for four people seems a little excessive, I think four is sufficient for a nice, mild soup. 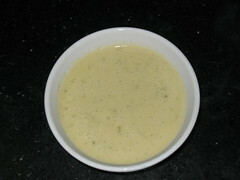 600ml of chicken stock also imparts too much saltiness, so perhaps 500ml stock and 400ml milk might do the trick. As a result, the soup was kind of heaty - but very good for a cold rainy day when you have the flu. 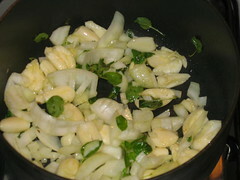 I also used marjoram instead of thyme, which was a mistake, because it adds dark flecks to the soup after blending. 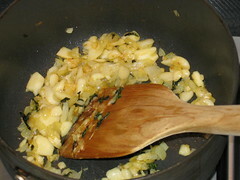 Heat some olive oil in a large, heavy based pan and gently cook the garlic, onion and thyme over very low heat for 20 to 30 minutes till they are completely soft but not coloured. The longer you cook them, the milder your garlic becomes, but the higher your chances of burning everything. Your call. My garlic was in large chunks, so they were getting browned before they were sufficiently soft. I used the spatula to break them up into smaller pieces, but this is probably a second-best solution. 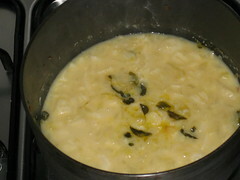 Once done, add the stock and milk, bring to the boil and simmer for 20 minutes. 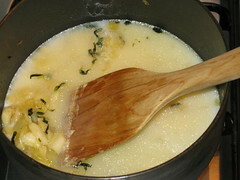 By now the soup should have thickened to the consistency of gruel. If, like me, you did add marjoram or some other big-leafed herb, you can try and fish them out with a fork before blending to improve the colour. Blend the lot in a blender till smooth, and serve in bowls, garnished with some snipped chives if you so desire. 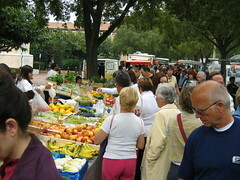 Yet another street market, this time a smaller one in the Provencal town of Arles. Nothing to see here, just sides of meats of all shapes and sizes sold to demand. There was this stall selling all sorts of Asian condiments and spices. 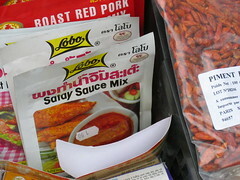 Things like satay sauce, soya sauce and other nifty things were on display, but unfortunately not many people were buying. There was another stall selling Vietnamese food cooked on the spot though, and that was popular. The spring rolls were pretty good. 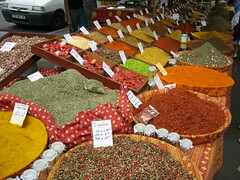 They were also very big on spices, selling all kinds of fresh herbs, peppers, cinnamon, colourful powders and exotic-smelling flakes. Lunch wasn't very interesting, so we'll move right on to dinner at La Maison Domaine de Bournissac. Culture is a very interesting thing. Something completely quotidian in one culture can seem unbelievably exotic and amazing in another. Take this amuse-bouche for instance. It is, in essence, a spring roll. Not that it wasn't nice or anything, just that I'm pretty sure no one in Asia would serve a fried spring roll as an appetiser. Weird. 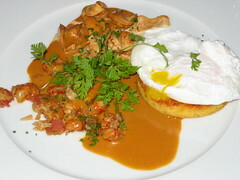 I had a risotto starter with poached egg, shrimp and chanterelles mushrooms. 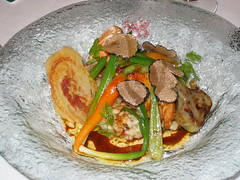 This was surprisingly good, as the risotto was perfectly cooked, neither too dense and soggy nor too light and fluffy. The poached egg added just the requisite amount of richness. Most people opted for the pork dish, which was cooked three ways: braised cheek, grilled tenderloin and roasted rib. I don't often take pork as a main course during dinner, but this was pretty well done - the cheek was fork-tender, and the tenderloin was almost beefy. The rib though, was somewhat scanty by way of meat. 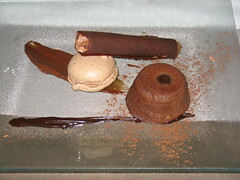 Dessert was an assortment of chocolate goodies: chocolate coulant, chocolate macaron and a chocolate cigar. The problem with chocolate desserts is that they tend to be rather rich, especially if portions are large - I couldn't finish the macaron. Day Seven was our transfer from Cavaliere to the town of Les Baux, near Provence. Along the way, we stopped by the town of St. Remy for lunch at a cafe. I decided up to this point I'd been eating quite a lot for dinner, so I thought I'd cut back on lunch by having a light salad. 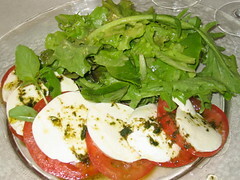 The salade caprese (salad, mozarella cheese and tomatoes) seemed like a good option. Unfortunately this was not a very good salad. The vegetables were limp, the tomatoes were not fresh and the cheese tasted kind of funky. No, it must be said this was one of the worse meals I had in France. Dinner was at La Cabro D'Or, a restuarant that was part of the family that included the hotels we were staying at. 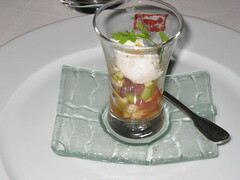 We started dinner with an amuse-bouche of a melange of local vegetables with a poached quail egg. This, I felt, was not particularly creative or special, and serving diced fruits and vegetables in a narrow glass to eat with a spoon is not exactly the most practical of ideas. I decided to order some pan-fried foie gras with chutney. Now, rich foods go with sweet things. This is one of those time-honoured traditions in cuisine like bread and butter. This is why chocolate isn't served with lime and you don't find vinegar creme brulee. Apparently this tradition has gone unnoticed by the restaurant, because the sauce and chutney was sour! Who makes sour chutney? This just ruined my foie gras - it was dreadful. Sweetbreads again, this time with some risotto and vegetables. The sweetbreads still tasted a bit chewy and starchy, not at all how I remember them to be. 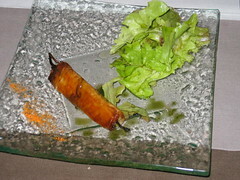 Either something is very wrong with my memory of having sweetbreads in London, or in France they're done differently. Now if there's one thing the French are good for, it's their treatment of chocolate. The chocolates and chocolate desserts I had throughout the trip were uniformly excellent. 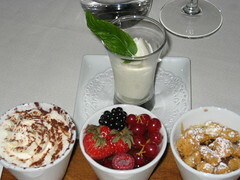 Here I was presented with three types of chocolate with a sorbet to cleanse the throat of all that cocoa. There was chocolate mousse with whipped cream, chocolate ganache with red fruits and chocolate with caramelised praline, which I was only too happy to finish. I think it's been a while since I've served chocolate as a dessert, and I've forgotten just how wonderful it can be. Soldier on, comrades, only four more days to go. Apparently I've got some new people reading and waiting impatiently for updates (hi Uncle Choo Eng), so I'll try and keep it moving. Today was an interesting day, one that I had been looking forward to. We'd spend the day preparing dinner under the tutelage of Roland Del Monte, a patisseur and Meuilleur Ouvrier of France - in other words he was selected as the best pastry chef in all of France in a particular year. 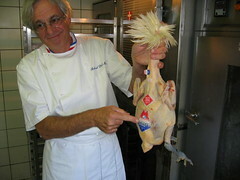 So here we see the maitre holding up the rather plump Bresse chicken. 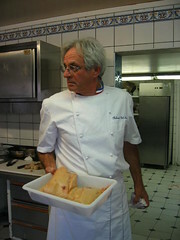 The blue, white and red collar he wears indicates him as a Meuilleur Ouvrier de France, though as a patisseur, not as a chef, as was soon apparent. 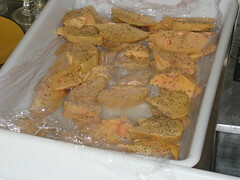 Our raw materials were all in the kitchen when we arrived, including these blocks of absolutely enormous fresh foie gras. I've only ever seen foie gras coming out of tins, so these huge livers were something new to me. 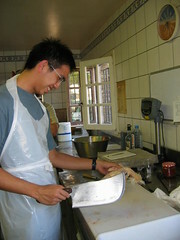 Since we were involved in much of the preparation, there were few pictures taken of us chopping up vegetables and preparing the food for the night's dinner. The knives we were using were very blunt, which surprised me for such a professional kitchen, but I suppose patisseurs don't use knives very often. 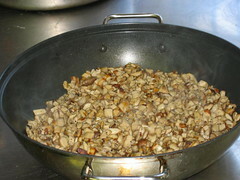 The mushrooms were diced, and sweated to rid them of the moisture contained within them. The amount of water that was evaporated was quite astounding. Unfortunately, it did seem that the mushrooms weren't exactly enjoying this treatment, because when we finally ate them, they seemed quite tasteless and indisguishable from any other sort of mushroom. 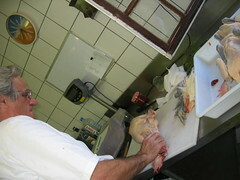 And here we see Roland showing us just how to hack the legs and neck off a chicken with a large cleaver. It was oddly satisfying work, though his cleaver was very blunt, which made chopping a somewhat arduous affair. That's me trying my hand at the same. Observe the large grin on my face. 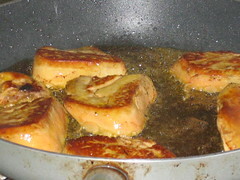 Nothing like freshly sliced foie gras, generously seasoned and ready for the frying pan to get those stomach juices going. 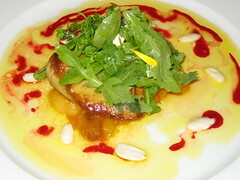 Foie gras, like duck, is amazingly fat. It's pretty much pure fat, so you don't even need oil to cook it. Just place it on a hot pan and watch the oil gush out like some primordial flood. 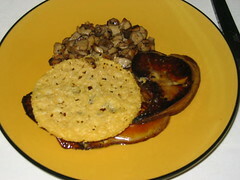 The finished foie gras. It was pretty good, melt in your mouth delicious and went really well with the cheese cracker you see, even if the mushrooms were a bit flat. 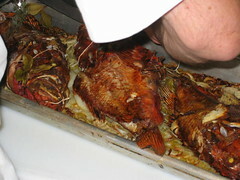 The chapons were stuffed with an inordinate amount of seafood and herbs. Fresh scallops, prawns, mussels and fish liver were blended along with parsley and piped into the chapons' mouths. Their gills even had to be tied down with string in order to prevent the stuffing from leaking out. After which, they were roasted in the oven. All in all, the fish came out rather dry, probably having sat in the oven for too long (we were a bit late for dinner, it must be admitted). A tian of roasted vegetables, which is basically a tray layered with tomatoes, cucumbers, zucchinis, leeks, herbs and oodles of olive oil. This was served together with the roast chicken you'll see in the next picture. The vegetables came out lovingly soft and melt lusciously in your mouth, but I did think it could have done with less olive oil. 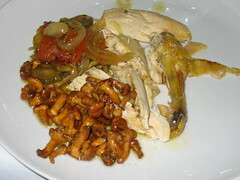 Roast chicken with roasted girolles mushrooms and a tian of vegetables. Like the fish, the chicken was a bit dry. Apart from issting in the oven too long, the chicken was also, as far as I know, not basted with the roasting juices nor was it stuffed with anything to prevent excessive loss of juice. Dessert was a fruit soup with orange blossom ice cream. 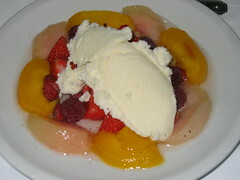 Two types of peaches were macerated in syrup overnight and flavoured with vanilla beans, then arranged on a plate with assorted red fruits. The orange blossom ice cream was made by Roland, and it was just heavenly. He makes a really mean ice cream, and that brought an otherwise pedestrian dessert to life. I think he should probably stick to being a patisseur and dessert chef. To finish off the meal, Uncle Choo Eng very kindly brought a bottle of Chateau d'Yquem (carefully bubblewrapped) all the way from Singapore. 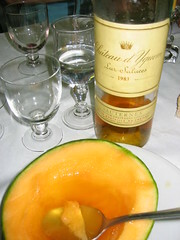 The idea was to find some ripe musk melon and hollow out the halves to serve the Yquem in, like the Japanese do [Edit: According to my father, drinking Yquem in this manner is actually a Singaporean invention. Go local culinary habits!]. Unfortunately, because the melons weren't ripe and sweet enough, they didn't do justice to the wine. Properly done, there is a spectacular efflorescence of the wine as the sweetness of both melon and grape burst in your mouth and slip down your throat. Regrettably, we didn't experience this that night, but it was a valiant effort nonetheless. My father commented that Roland had probably never had the chance to try an Yquem, and probably thought us all stark raving mad for wanting to drink it out of some cheap fruit. This is probably true. In any case, dinner was passable; not what I would have expected from a meuilleur ouvrier, but I suppose one shouldn't judge a book by its cover, even if it does have a tricolour collar on it.